In a talk that spanned a range of topics, including the Polar Plunge, charter schools, and predicting future elections, the mayors of four of the United States’s biggest cities spoke about the challenges they face and the role of teamwork in overcoming those challenges, in what was called an “unprecedented” event. 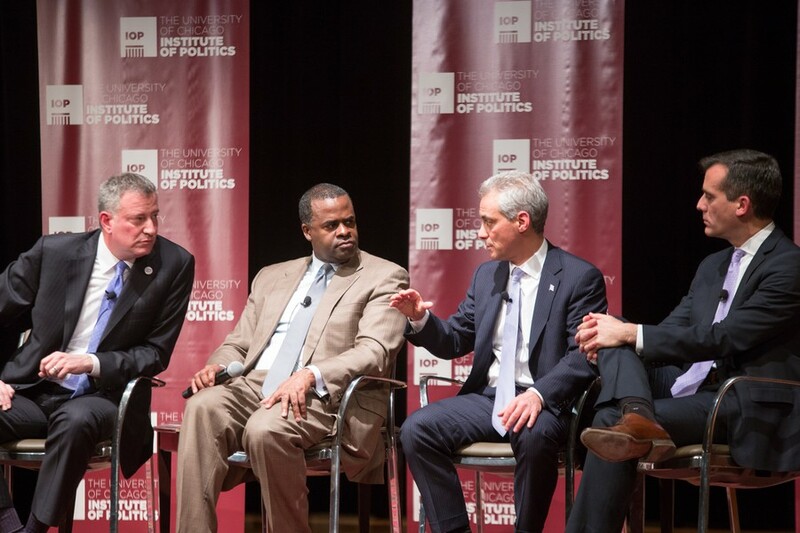 Mayors Rahm Emanuel of Chicago, Kasim Reed of Atlanta, Bill de Blasio of New York City, and Eric Garcetti of Los Angeles took part in a discussion on Thursday evening at International House, sponsored by the Institute of Politics (IOP) and the International House Global Voices Program and moderated by IOP Institute Director David Axelrod (A.B. ’76). The evening began on a good-humored note when Garcetti ribbed Chicago for its weather. “I’m not sure what all that white stuff outside is. I put my hand in it, and it hurts,” he said. This camaraderie and sense of teamwork continued throughout the discussion, with the mayors often praising each other’s efforts in their cities. De Blasio often clapped Reed on the shoulder, and Emanuel frequently went for highfives and fist bumps from the others after making a joke. Reed, who was a state legislator before becoming Atlanta’s mayor in 2010, described one of his first experiences in public office. When he went up to the podium to speak during a session of the State House, the Speaker told him that it should be a year before he, as a new representative, should speak during the session. “I thought that I had been elected, [but] he took my parking space, and he moved it so far away,” Reed said. “And you didn’t speak for a year,” Emanuel joked. “Yeah, because of that walk!” Reed exclaimed. The mayors all agreed that one of the largest issues they were facing was a lack of support from state and federal governments. “We know there is not a cavalry coming right now from Washington,” de Blasio said. De Blasio contended that it would be more efficient for the federal government to send money directly to cities as opposed to states, and Reed agreed. To confront these issues, the mayors spoke of the importance of working together among mayors and among citizens to move forward and revitalize the country through its metropolitan areas. For the New York City Mayor, these debates go beyond their local contexts.